And the server went down for a third time interfering with my HPit - first outage, LSTB node 3 2nd time, and now my node 3 star fighter win. 330 ROLO shards or free 7* Sith Bomber. Thanks. So this is happening to guildies. You can tell from the background this is a completed ROLO mission. How is CG going to fix this? That's going to be freaking complex. This was AFTER the servers were back up. 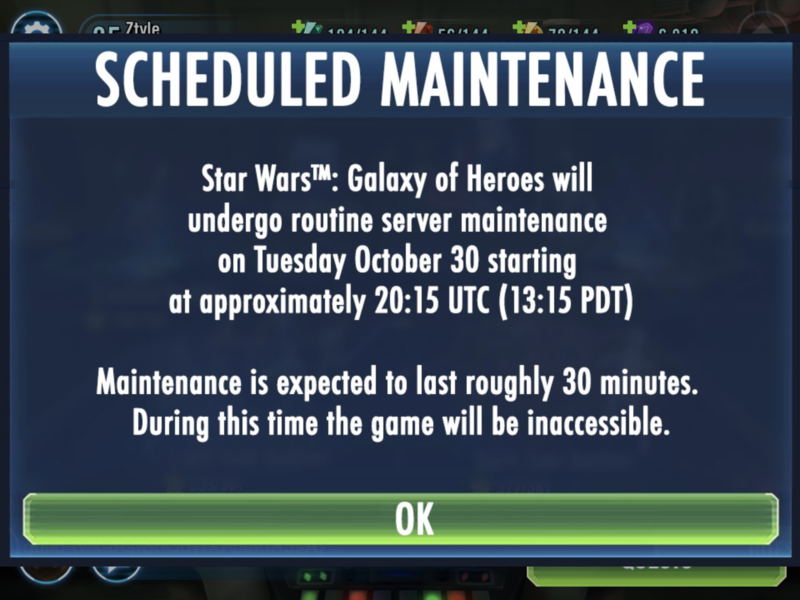 I'm going to expect at least 5 Clone Wars Chewbacca shards for this. Free Mission shards as compensation! Only appropriate, right? The servers have been back for a while but the game is just unplayable. 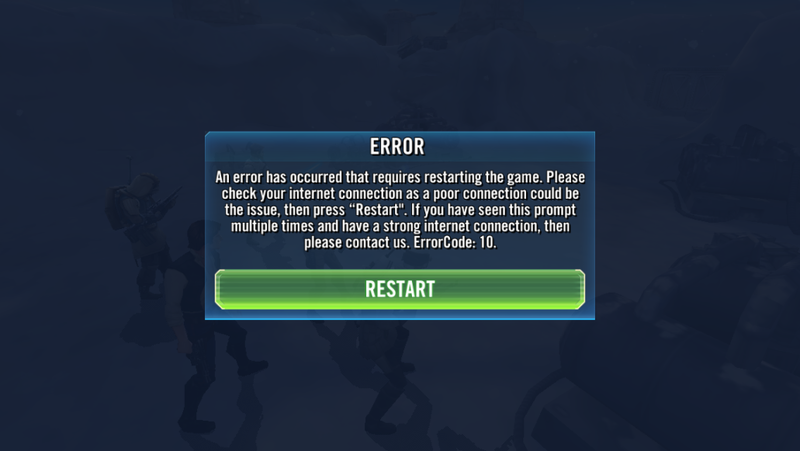 You can log in but it crashes for trying to do anything in-game. Just try to convey to all of your guildmates not to do anything in Territory Battles for the time being. I was lucky enough to have it happen to me right away (when the servers were "fixed") so at least everyone on our discord server is aware. Their fix this time should be to at least give us the special mission rewards we gained last outing. European payouts were destroyed by this server issue. I'm from the UK but live in the US now and I sympathise deeply with their inability to climb in their last hour. As for the US and other continents, it's energy refreshes. However, consideration of missed raids, LSTB boots during missions and everything else adds up. STR starts for me in 21 minutes. Missed Rancor so relying on where I was randomly placed. I hope the compensation returns to its prior state of 500 crystals but for the players who finish high in both arenas across Europe, this won't be sufficient. PLEASE ensure the compensation we receive (if there's none after the Revan cash I'd be mind blown) is respectful to all issues faced today. It's under 2hrs, yes, but the damage is done and as they say, time is money. This is garbage. Wasted a fleet battle. Won’t dare do TB for fear of a crash. Arena is a gamble. I get that this is a live game. And I have ZERO experience in game development. But I do know that most business IT shops do their updates and maintenance during off peak hours. Perhaps CG should do the same? Yeah, this is a global game, but I’d put a strong guess that the plurality of the player base is in the time zones for the Americas. In short, sort it out quickly or I and others like me WILL be leaving. PS: Before some clever mod comes along and says I'm "calling someone out" and deletes this or bans me, think again! There is nothing personal here other than me, a paying customer being affronted by a very poor show and as such offering fair and constructive comment. I'm not a mod, but bye, it's been fun! As the title states, game error caused multiple members a loss on bonus energy at mid-day. This will directly effect raid ticket generation, raid launches and reward timing for guild members. Did anyone else experience this? Does EA have a plan for this issue? Thanks. Have an officer go in and place "Prohibit Engagement" flags on each individual mission and "confirm + notify". Then if anyone does it anyway they get a stern warning, because after that there's no excuse. They even get a notification outside of the game and inbox. We had an issue with both members being able to hit a heroic raid and others not (which means better gear for those with no problems) and members having the game restart in the middle of Combat Missions after finally getting in. Now guild officers have to put out he fires as to why those players didn’t wait to raid, blah, blah. Supposedly this is the maintenance that yesterday's pop up said was next week. Just got off the phone with the EA support and that is their story and I mentioned some compensation for lost progress for getting kicked during battles but it was pretty much ignored. My fault for being on during scheduled maintenance. They also informed me the pop up date was today. Lots of our guilds Tb missions got screwed today. I just logged back in and I'm not ranked #1 in either arena and it seems my toons are overall just mediocre. I demand compensation for what must have been caused by this server issue!!! Methinks there are plenty screenshots disproving this! @TarkusZ If they've said that, pull the screenshots of the scheduled maintenance from somewhere on here and reopen your case with those attached. I contacted EA customerno-service during the scandalous bounty hunter bonus drops(not)Gate. They basically said they intended for the mistake to happen ... understands it’s frustrating but can’t (won’t) do anything about it. But this servergate scandal thing is much worse. Call your local congressman.